the republic of pirates by colin woodard is the best pirate book i've read. it was detailed and placed the right amount of emphasis on historical facts without drowning the reader in dates, names and places. for me, there were a few things that stood out as well as a few things that i was curious to learn about. first off - why did people turn to piracy. this book answers that question quite well. privateering was essentially government-endorsed piracy. so when the wars between france, england, spain and the other countries ceased, so did the privateers income. and not only that, but the reader must also realize that the sailor's life was practically worse than a slave's life. this was the other's other point about why people turned to piracy. one example the author used to illustrate how bad a sailor's life was, was about this young boy who the captain beat quite savagely for 17 days! he beat him, whipped him, made him eat his own stool and when the boy finally spoke, he asked for something to drink. the captain ran to his quarters and then returned with a cup of his own urine and made the boy drink it. the boy finally died. so, the lack of authorization to privateer at war's end and the abuses suffered by many, some sailors were practically forced to piracy in order to survive. the author also goes into some detail to tell the story and legend of henry avery. this pirate lived a couple of decades before the caribbean pirates and probably inspired many of them to turn to piracy. another reason for piracy had to do with the english government. this was one of those new things i learned. when the house of hanover assumed power, many loyalists to the house of stuart became pirates. in fact, some pirates disagreed with each other because some pirates wanted to attack english interests while others did not. in summary, each pirate had his reason for piracy. the democracy of the pirates was quite interesting. 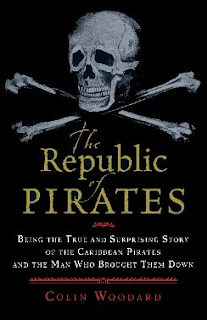 although the book was marketed to indicate that the caribbean pirates were actually early american revolutionaries, the book didn't quite make the connection. there was no evidence that some pirates eventually contributed ideas to the american revolutions. true, the form of democracy the pirates practiced was revolutionary, but i didn't see any other strong connection to the american revolution. in fact, it seems the british citizens in america were the most strong-willed people who had the greatest effect on the downfall of the golden age of piracy. woodes rogers - what a tragic life. his story is interesting and sad, but, again, he didn't come across as the man who brought down the pirates. the subtitle of the book is: being the true and surprising story of the caribbean pirates and the man who brought them down. woodes rogers is apparently that man. but in the book, his role wasn't as strong as the sub title would suggest. true, he had a vision to reform madagascar and the pirates there; and true he lead a company to the caribbean to end piracy, but when he actually got there, he seemed way more reticent than expected. the royal navy abandoned him shortly after arriving at nassau. the people he had to work with were lazy and ultimately he was afraid vane and the other pirates would return to kill him. sadly, after all his money was spent, he was cast into debtors prison and eventually died and was buried in nassau. most of the pirates expired around 1718-19. but the one pirate who outlasted them all was charles vane. first off, read the book - it's worth the read. thirdly, nbc is doing a mini-series on blackbeard which will be based off woodard's book. nbc began filming it in puerto rico about a month ago (link). the series will be called crossbones starring john malkovich. i'm looking forward to that!